Hiroo Onoda, an Imperial Japanese Army officer who remained at his jungle post on an island in the Philippines for 29 years, refusing to believe that World War II was over, and returned to a hero’s welcome in the all but unrecognizable Japan of 1974, died on Thursday in Tokyo. He was 91. His death, at a hospital there, was announced by the Japanese government. Caught in a time warp, Mr. Onoda, a second lieutenant, was one of the war’s last holdouts: a soldier who believed that the emperor was a deity and the war a sacred mission; who survived on bananas and coconuts and sometimes killed villagers he assumed were enemies; who finally went home to the lotus land of paper and wood which turned out to be a futuristic world of skyscrapers, television, jet planes and pollution and atomic destruction. Japanese history and literature are replete with heroes who have remained loyal to a cause, especially if it is lost or hopeless, and Lieutenant Onoda, a small, wiry man of dignified manner and military bearing, seemed to many like a samurai of old, ultimately offering his sword as a gesture of surrender to President Ferdinand E. Marcos of the Philippines, who returned it to him. And his homecoming, with roaring crowds, celebratory parades and speeches by public officials, stirred his nation with a pride that many Japanese had found lacking in the postwar years of rising prosperity and materialism. His ordeal of deprivation may have seemed a pointless waste to much of the world, but in Japan it was a moving reminder of the redemptive qualities of duty and perseverance. It happened with a simple command. As he related in a memoir after he went home, Lieutenant Onoda’s last order in early 1945 was to stay and fight. Loyal to a military code that taught that death was preferable to surrender, he remained behind on Lubang Island, 93 miles southwest of Manila, when Japanese forces withdrew in the face of an American invasion. After Japan surrendered, that September, thousands of Japanese soldiers were scattered across China, Southeast Asia and the Western Pacific. Many stragglers were captured or went home, while hundreds went into hiding rather than surrender or commit suicide. Many died of starvation or sickness. A few survivors refused to believe the dropped leaflets and radio announcements saying the war had been lost. Lieutenant Onoda, an intelligence officer trained in guerrilla tactics, and three enlisted men with him found leaflets proclaiming the war’s end, but believed they were enemy propaganda. They built bamboo huts, pilfered rice and other food from a village and killed cows for meat; they were tormented by tropical heat, rats and mosquitoes, and they patched their uniforms and kept their rifles in working order. Considering themselves to be at war, they evaded American and Filipino search parties and attacked islanders they took to be enemy guerrillas; about 30 inhabitants were killed in skirmishes with the Japanese over the years. One of the enlisted men surrendered to Filipino forces in 1950, and two others were shot dead, one in 1954 and another in 1972, by island police officers searching for the renegades. The last holdout, Lieutenant Onoda, officially declared dead in 1959, was found by Norio Suzuki, a student searching for him, in 1974. The lieutenant rejected Mr. Suzuki’s pleas to go home, insisting he was still awaiting orders. 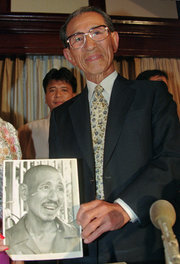 Mr. Suzuki returned with photographs, and the Japanese government sent a delegation, including the lieutenant’s brother and his former commander, to relieve him of duty formally. “I am sorry I have disturbed you for so long a time,” Lieutenant Onoda told his brother, Toshiro. In Manila, the lieutenant, wearing his tattered uniform, presented his sword to President Marcos, who pardoned him for crimes committed while he thought he was at war. 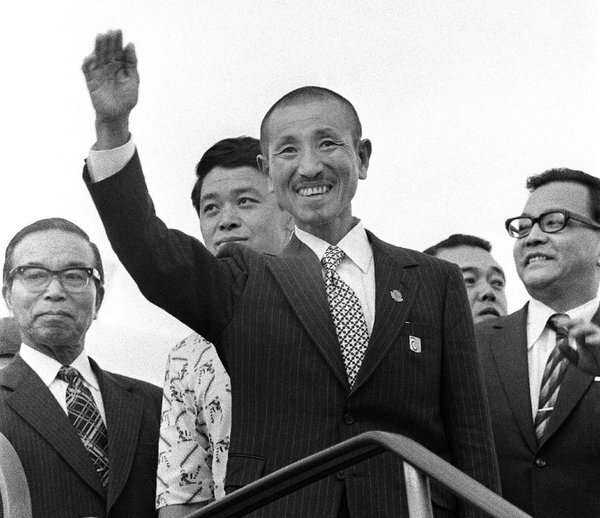 He was already a national hero when he arrived in Tokyo, met by his aging parents and huge flag-waving crowds. More than patriotism or admiration for his grit, his jungle saga, which had dominated the news in Japan for days, evoked waves of nostalgia and melancholy. The 52-year-old soldier — a ghost from the past in a new blue suit, close-cropped military haircut and wispy mustache and chin whiskers — spoke earnestly of duty, and seemed to personify a devotion to traditional values that many Japanese thought had been lost. After his national welcome in Japan, Mr. Onoda was examined by doctors, who found him in amazingly good condition. He was given a military pension and signed a $160,000 contract for a ghostwritten memoir, “No Surrender: My-Thirty Year War.” As his story went global in books, articles and documentaries, he tried to lead a normal life. In 1975 he moved to a Japanese colony in São Paulo, Brazil, where he raised cattle. The following year he married Machie Onuku, a Japanese tea-ceremony teacher. The couple returned to Japan in 1984 and founded the Onoda Nature School, a survival-skills youth camp. Mr. Onoda revisited Lubang, the site of his long holdout, in 1996 and gave $10,000 to a school there. In recent years he lived in Japan and in Brazil, where he was made an honorary citizen in 2010. 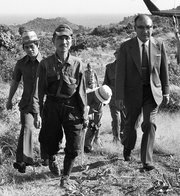 Hiroo Onoda was born on March 19, 1922, in Kainan, Wakayama, in central Japan, one of seven children of Tanejiro and Tamae Onoda. At 17 he went to work for a trading company in Wuhan, China, which Japanese forces had occupied in 1938. In 1942 he joined the Japanese Army, was singled out for special training and attended the Nakano School, the army’s training center for intelligence officers. He studied guerrilla warfare, philosophy, history, martial arts, propaganda and covert operations. It was in late December 1944 that he arrived on Lubang, a strategic island 16 miles long and 6 miles wide on the southwestern approach to Manila Bay and the island of Corregidor. His orders were to sabotage harbor installations and an airstrip to disrupt a coming American invasion. But superior officers on the island superseded those orders to focus on preparations for a Japanese evacuation. When American forces landed on Feb. 28, 1945, and the last Japanese fled or were killed, Maj. Yoshimi Taniguchi gave Lieutenant Onoda his final orders, to stand and fight. “It may take three years, it may take five, but whatever happens we’ll come back for you,” the major promised. Twenty-nine years later, the retired major, by then a bookseller, returned to Lubang at Tokyo’s request to fulfill his promise. Japan had lost the war, he said, and the lieutenant was relieved of duty. The ragged soldier saluted and wept.